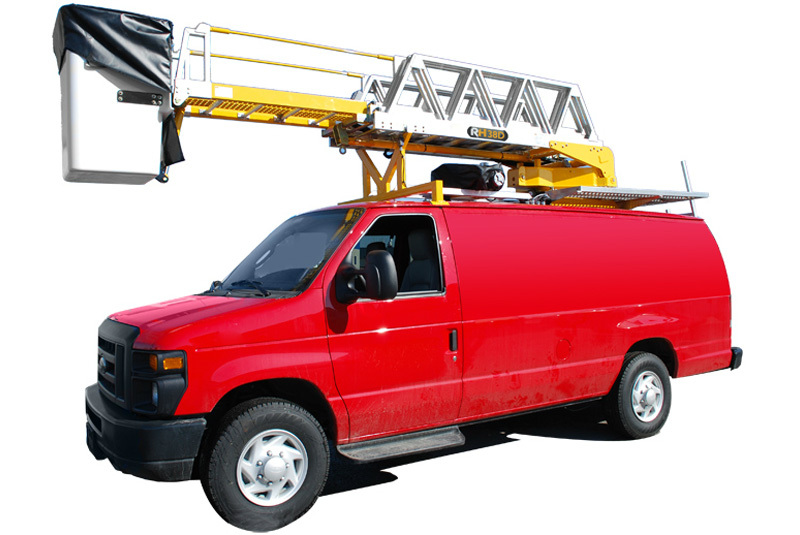 The RH35 is a non-insulated telescoping ladder with a working height of 35 ft (10.67 m). 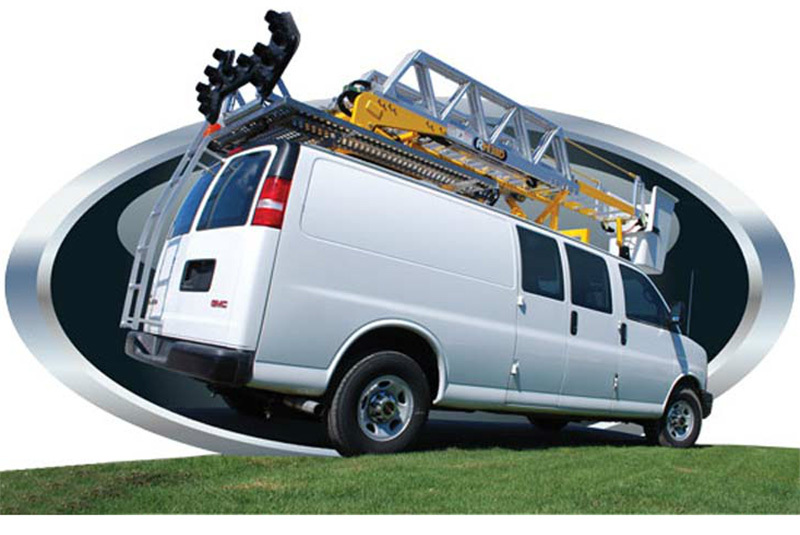 The RH35 has a 3-section ladder and a lift ring, as do most of our products. With the RH35, you get the rugged reliability and quality RH aerial ladders are known for. 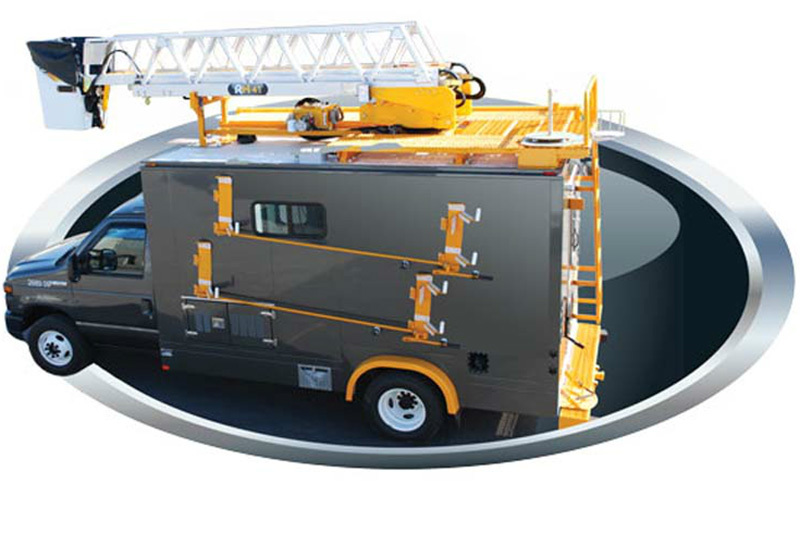 And that’s not to mention the many other benefits and options available to ensure that RH aerial ladder equipment meets your specific needs. 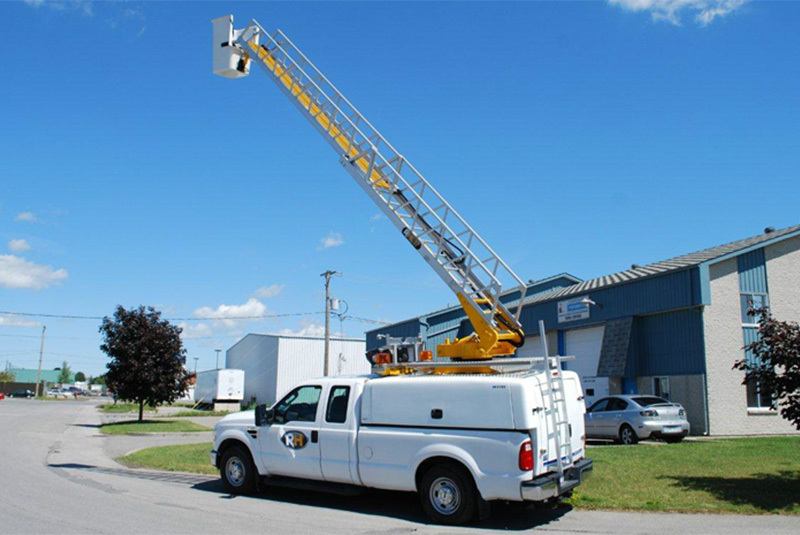 This type of aerial ladder must be installed on vehicles whose GVWR (gross vehicle weight rating) is greater than 9,500 lbs (4,309 kg). 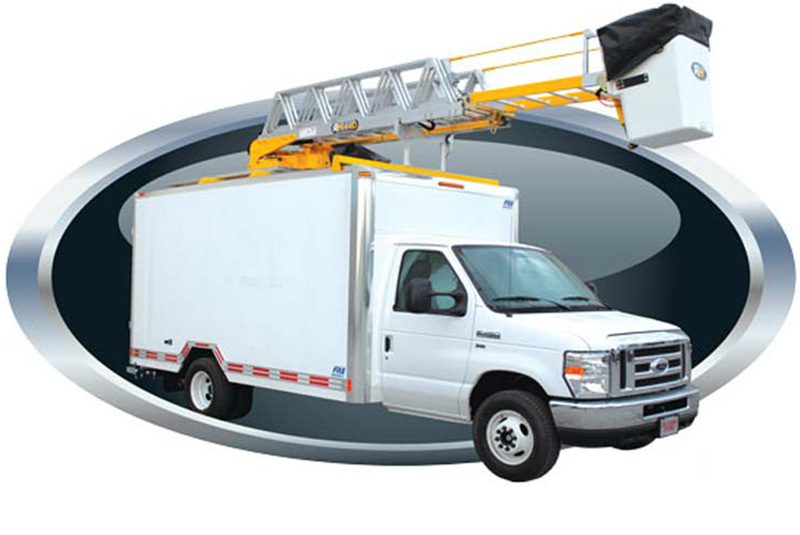 Outriggers are generally not required. 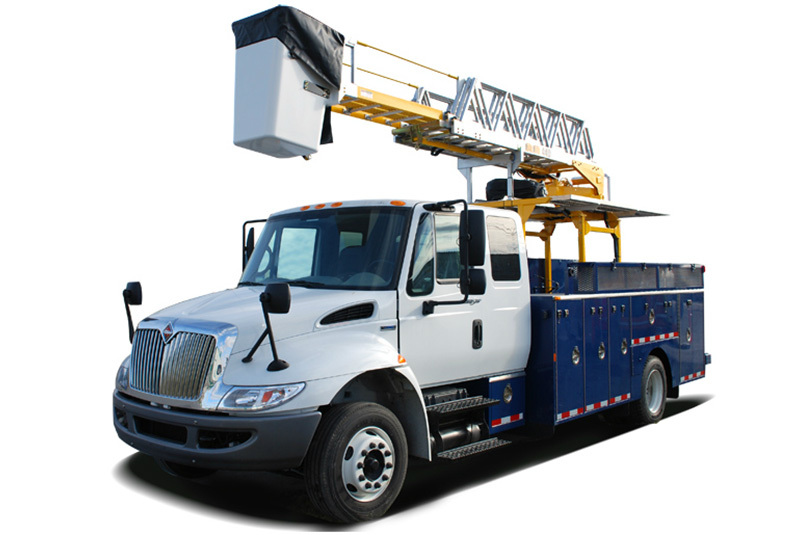 However, outrigger requirements must be confirmed by means of stability tests performed on your bucket truck. 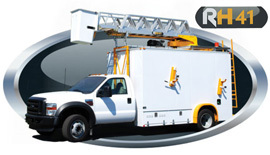 The RHL37 is a non-insulated telescoping ladder with a working height of 37 ft. The “L” in RHL37 refers to the lightweight design of the ladder, which has just two sections for minimized weight and manufacturing costs. 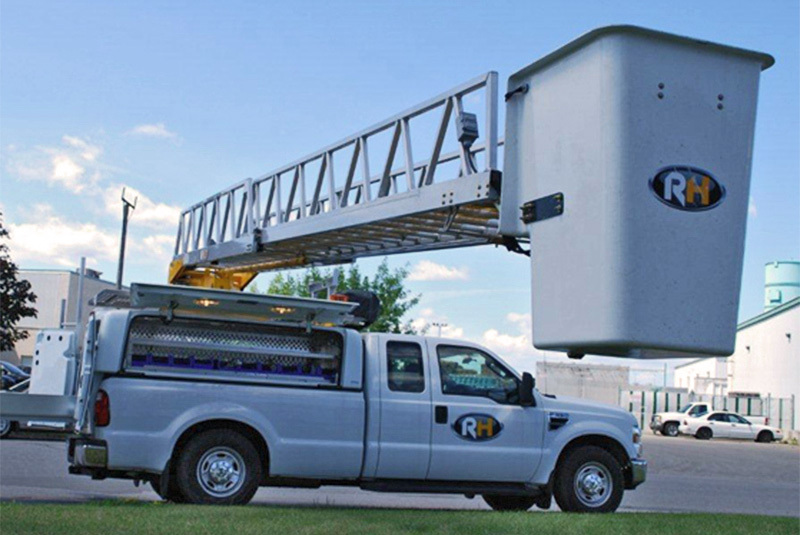 As Robert Hydraulique’s lightest ladder model, the RHL37 reflects the firm’s commitment to R&D and its use of advanced technologies to reduce equipment weight without compromising safety. 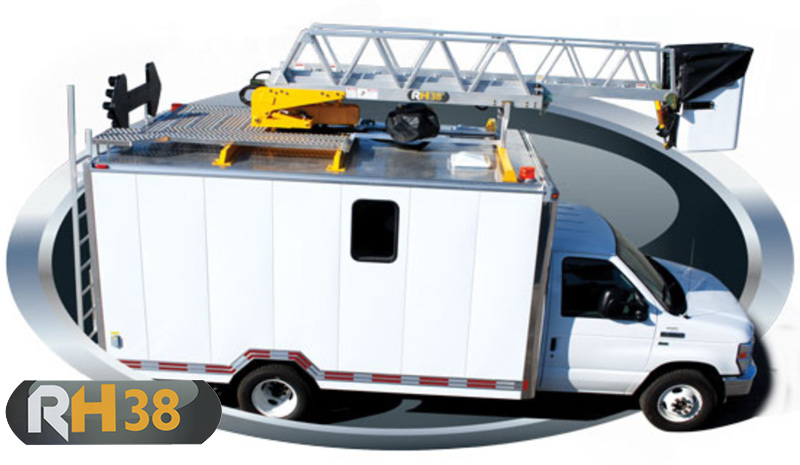 With the RHL37, you get the ruggedness and quality Robert Hydraulique is known for, at a very attractive price. 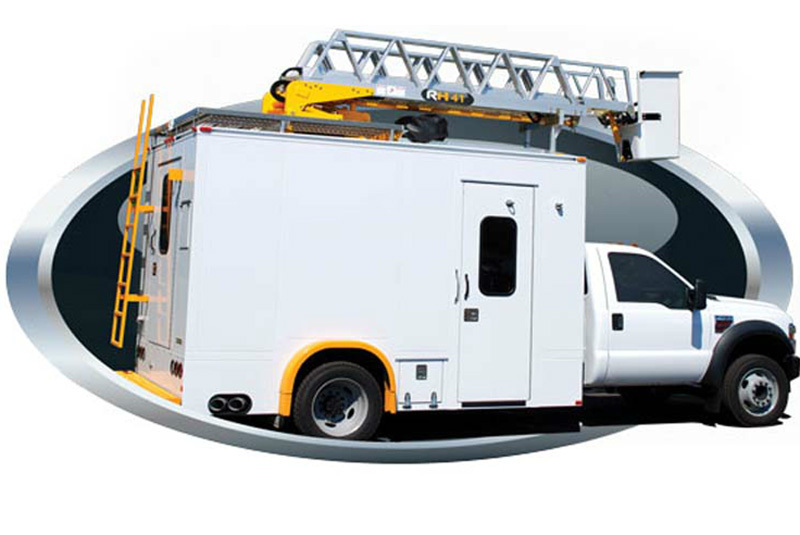 And that’s not to mention the many other benefits and options available to ensure that RH aerial equipment meets your needs. 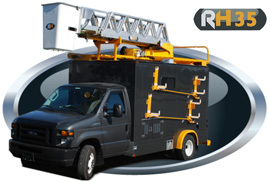 The RH38 is a non-insulated telescoping ladder with a working height of 38 ft. 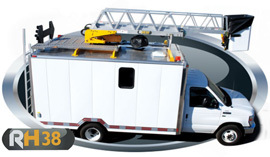 The RH38 has a 3-section ladder and a lift ring, as do most of our products. 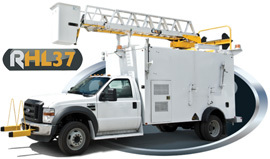 With the RH38, you get the rugged reliability and quality RH aerial ladders are known for. 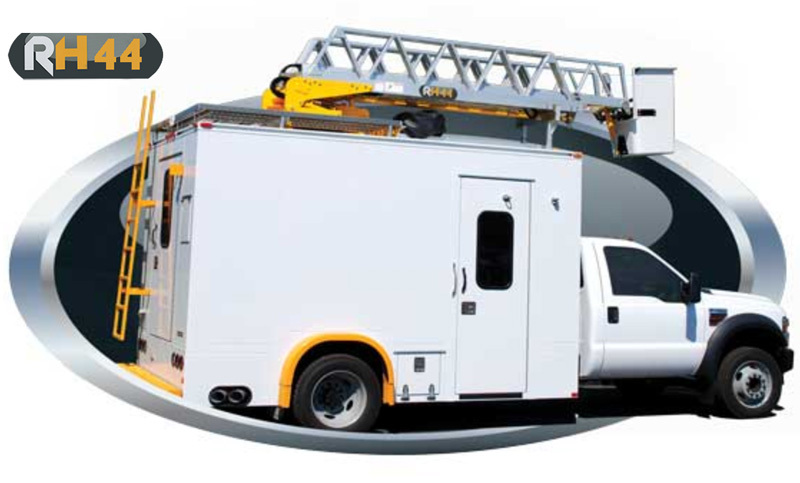 And that’s not to mention the many other benefits and options available to ensure that RH aerial ladder equipment meets your specific needs. This type of aerial ladder must be installed on vehicles whose GVWR is greater than 9,500 lbs. 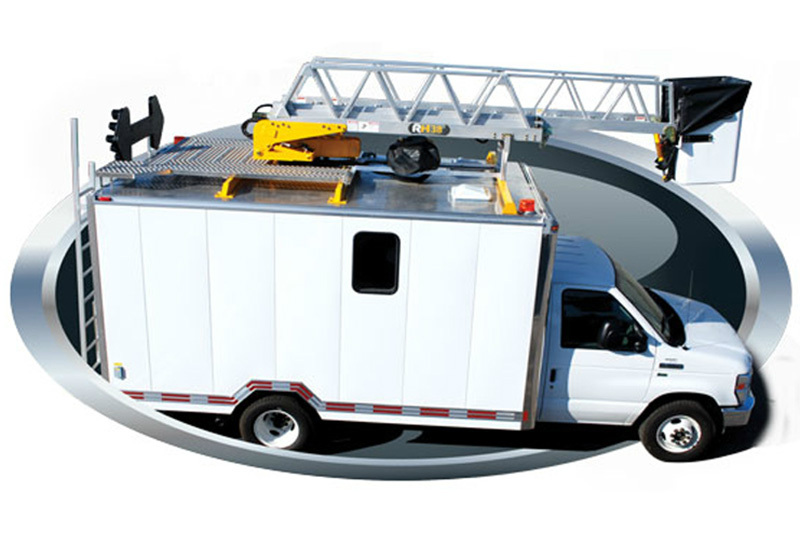 However,outrigger requirements must be confirmed by means of stability tests performed on your bucket truck. 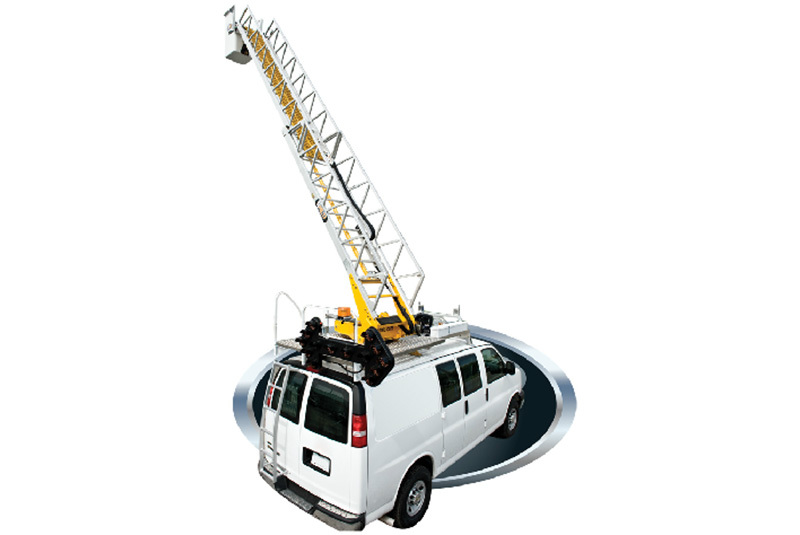 The RH41 is a non-insulated telescoping ladder that extends to a working height of 41 ft (12.50 m). 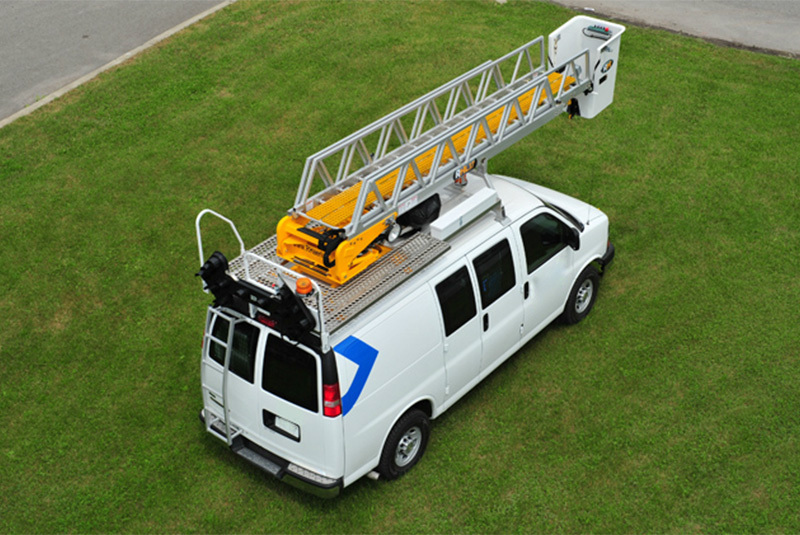 The RH41 has 3 ladder sections and a lift ring like most of our products. With the RH41, you get the rugged reliability and quality that RH aerial ladders are known for, at the best price. 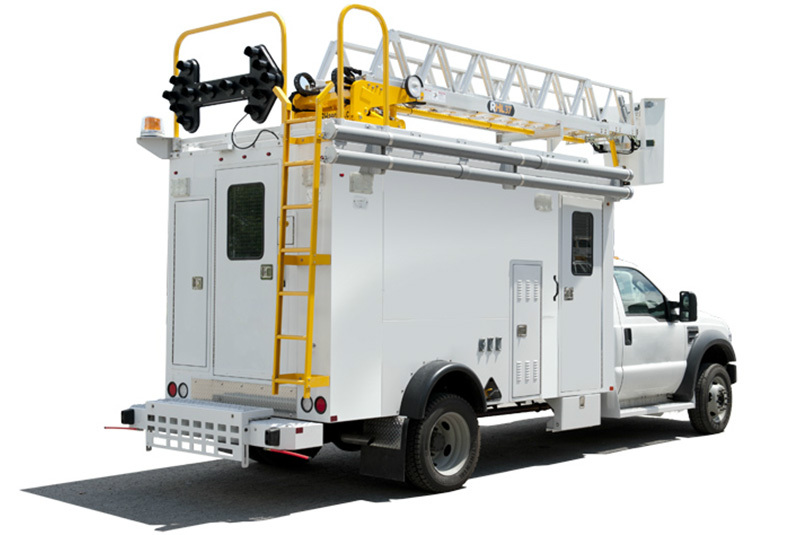 And that’s not to mention the many other benefits and options available to ensure that RH aerial ladder equipment meets your specific needs. 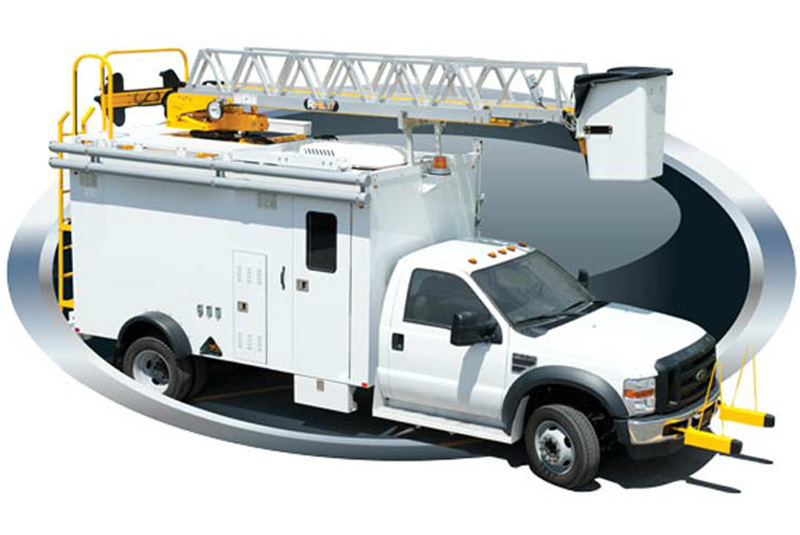 This type of aerial ladder must be installed on vehicles whose GVWR is greater than 9,500 lbs. 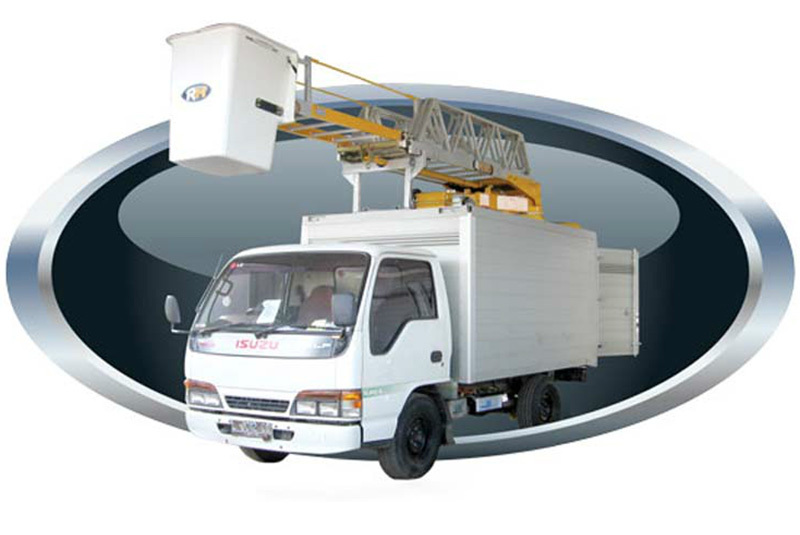 Outriggers are generally not required. 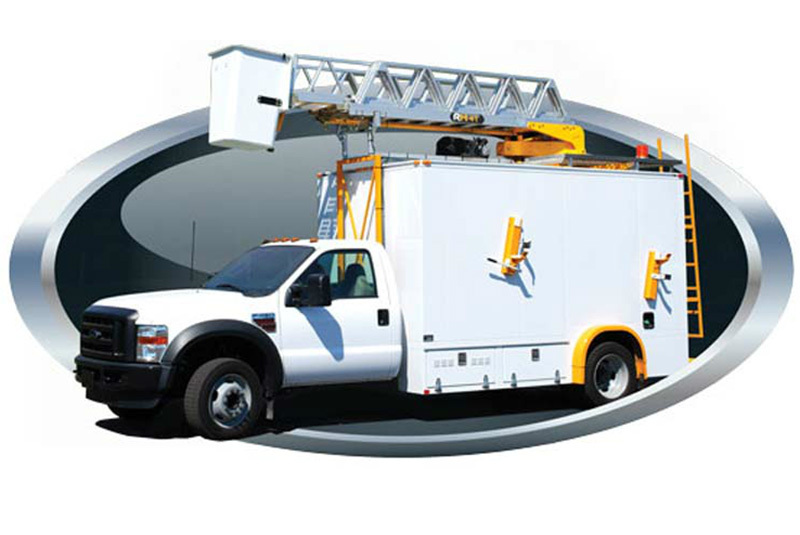 Outrigger requirements must be confirmed by means of stability tests performed on your bucket truck. 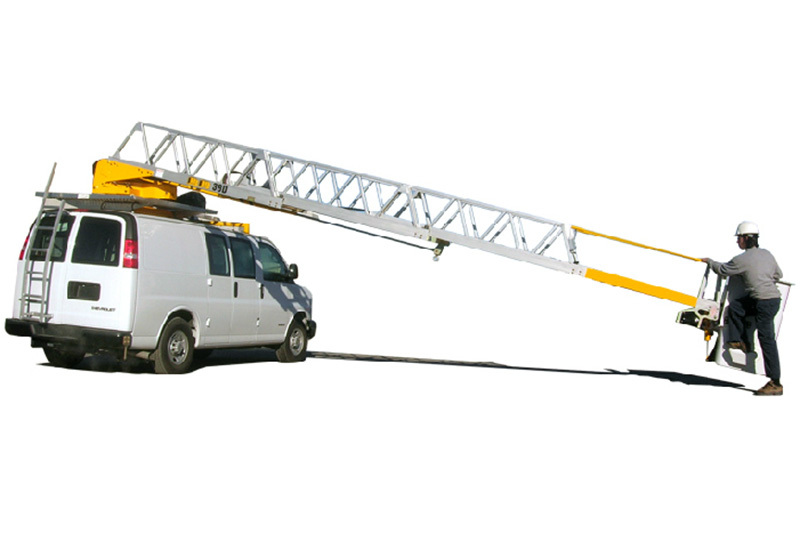 The RH44 is a non-insulated telescoping ladder with a working height of 44 ft (13.41 m), comprising three ladder sections for optimal efficiency. 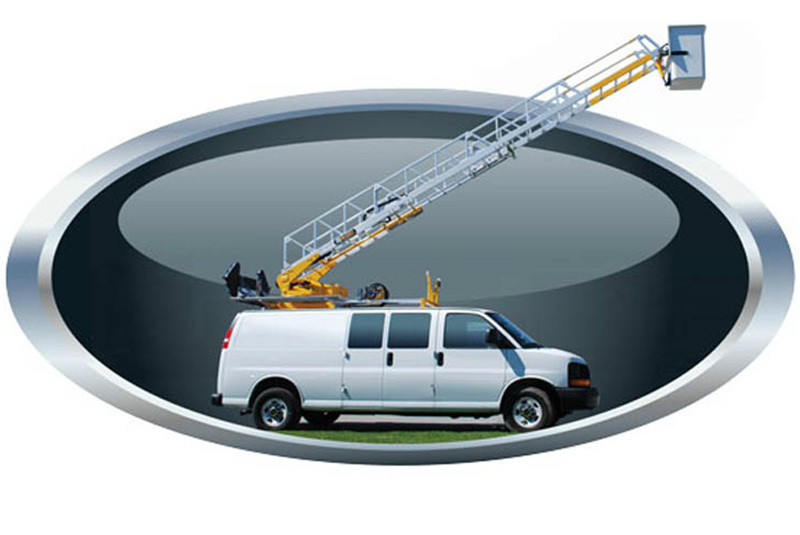 The lift ring located at the end of the second section is a standard accessory and can lift loads of 550 lbs (250 kg) in any position, regardless of carrier vehicle. 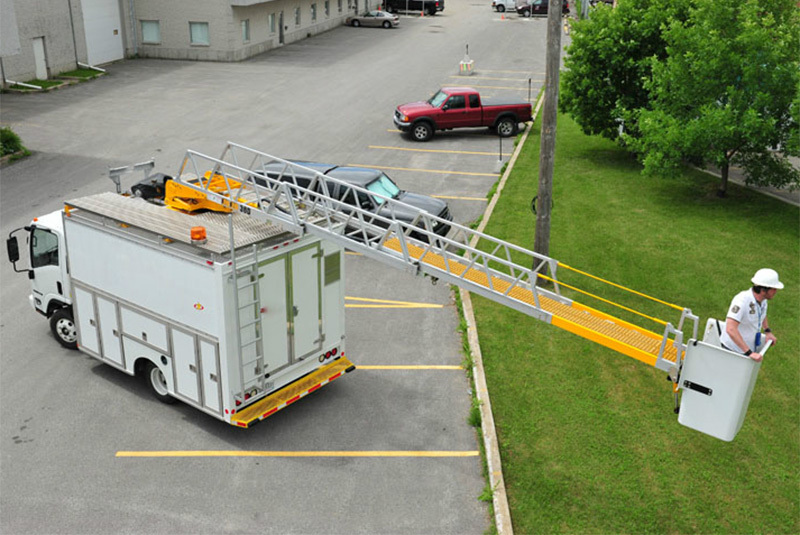 And that’s not to mention the many other benefits and options available to ensure that RH aerial ladder equipment meets your specific needs. 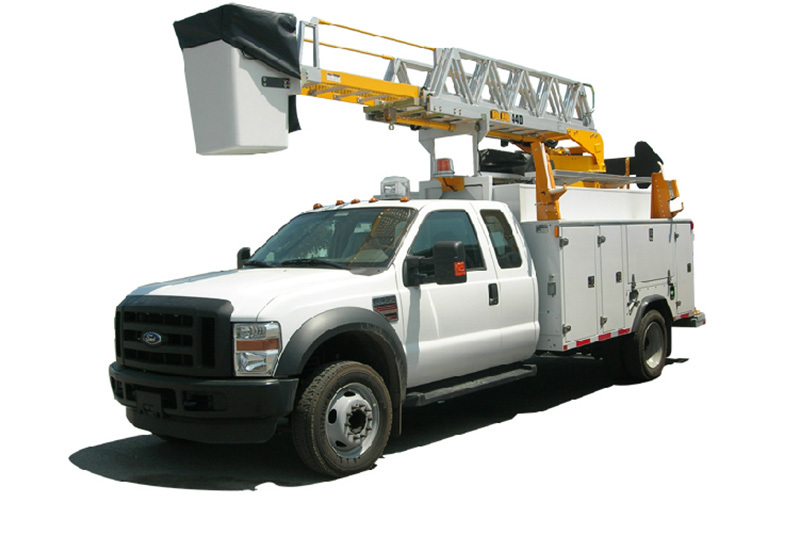 This type of aerial ladder must be installed on vehicles whose GVWR is greater than 9,500 lbs. 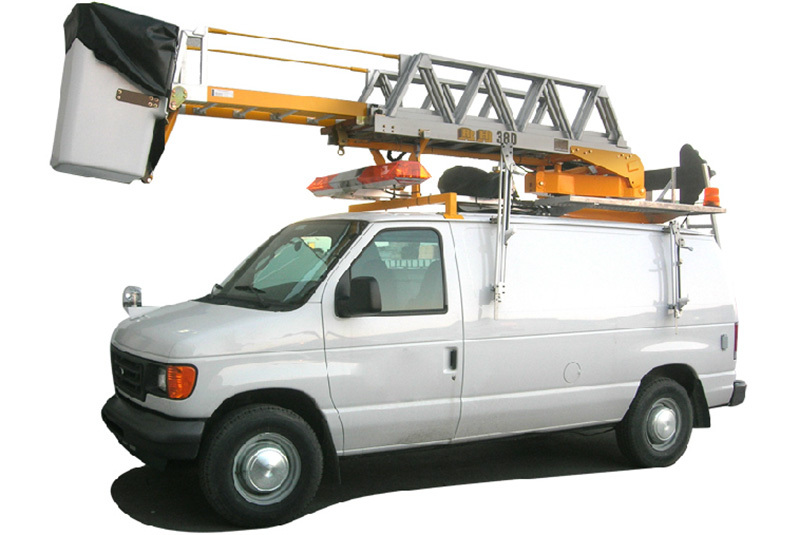 Outriggers are generally not required. 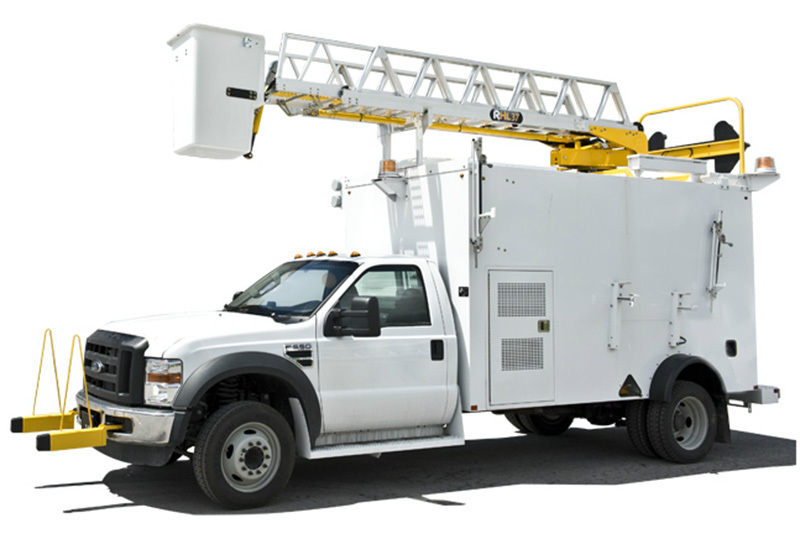 Outrigger requirements must be confirmed by means of stability tests performed on your bucket truck. 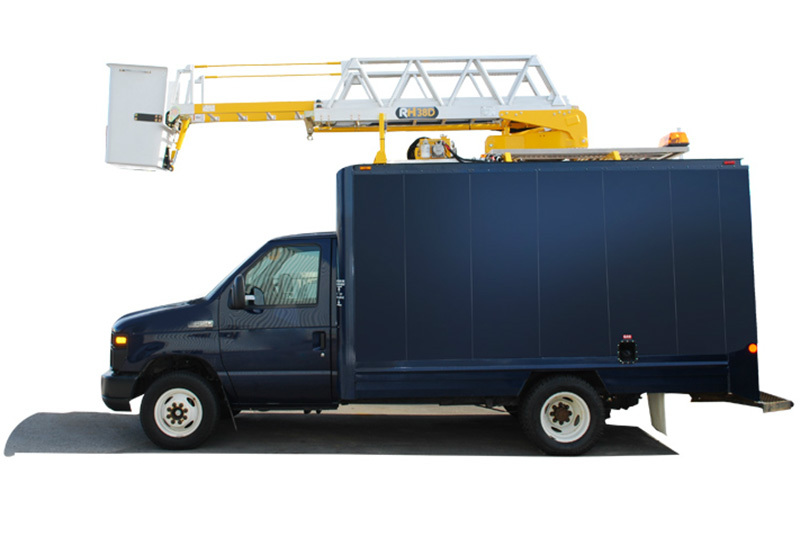 The RH47 is a non-insulated telescoping ladder with a working height of 47 ft (14.33 m), comprising three ladder sections for optimal efficiency. 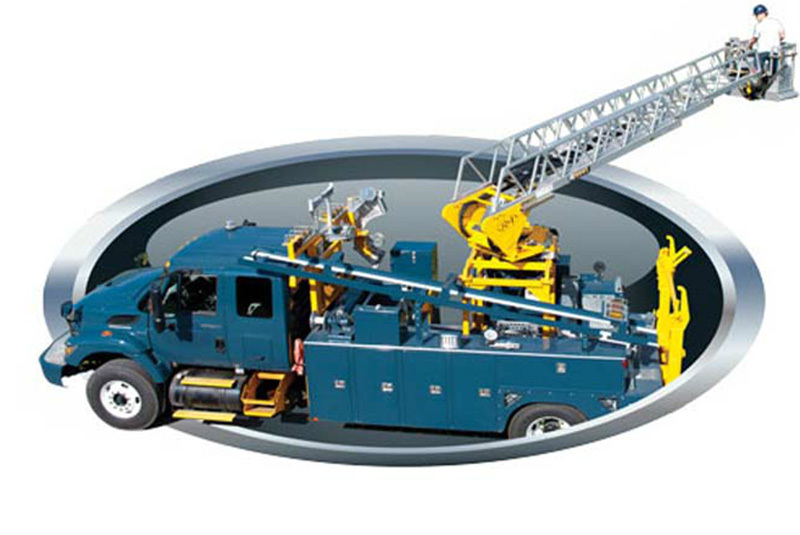 The lift ring located at the end of the second section is a standard accessory and can lift loads of 550 lbs (250 kg) in any position, regardless of carrier vehicle. 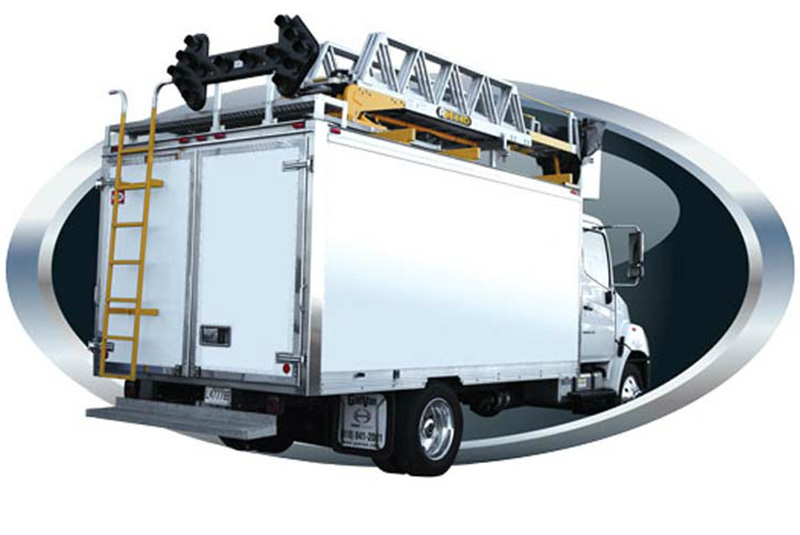 And that’s not to mention the many other benefits and options available to ensure that RH aerial ladder equipment meets your specific needs. 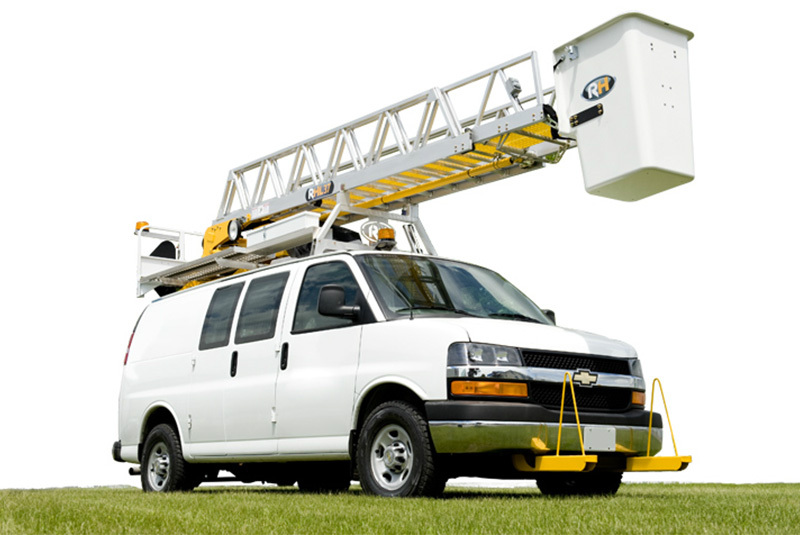 This type of aerial ladder must be installed on vehicles whose GVWR is greater than 9,500 lbs. 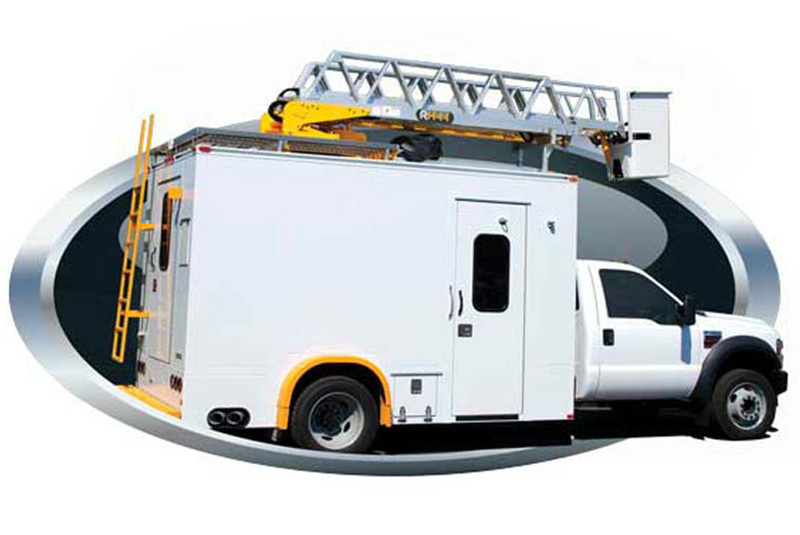 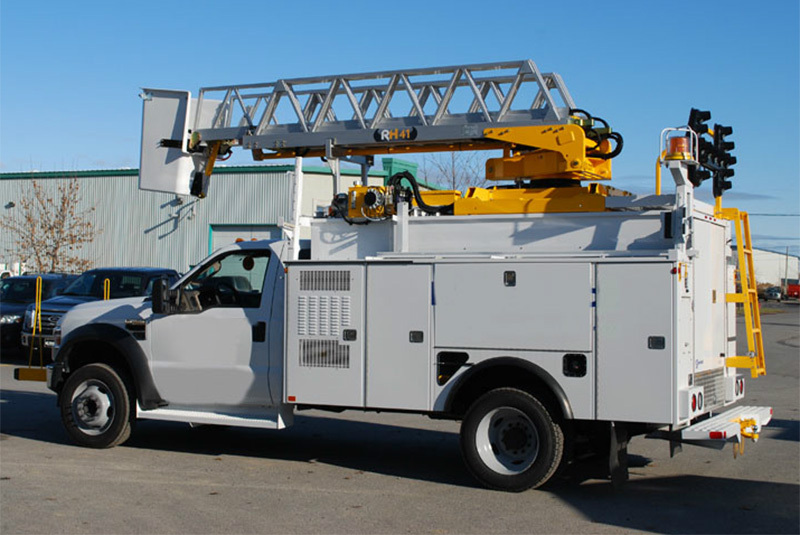 Adapted to More Lightweight Carrier Vehicles - The design and materials used in manufacturing RH hydraulic ladders enables them to be installed on vehicles with a GVWR as low as 9,500 lbs. 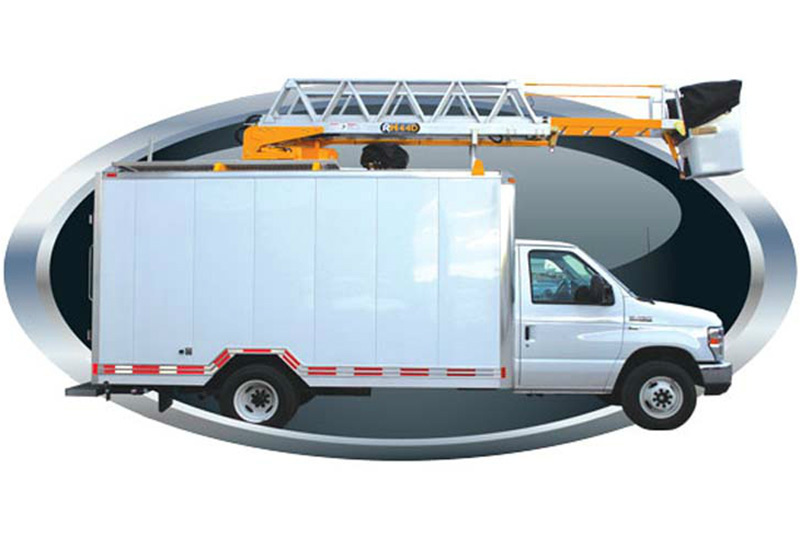 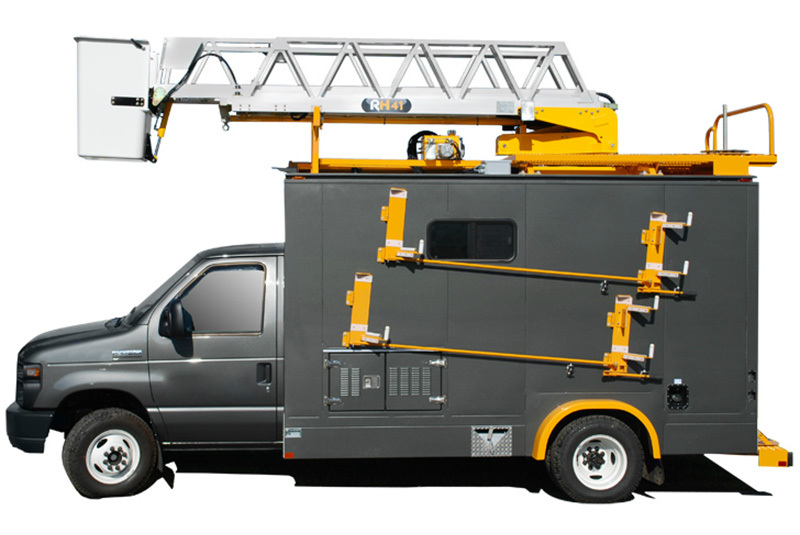 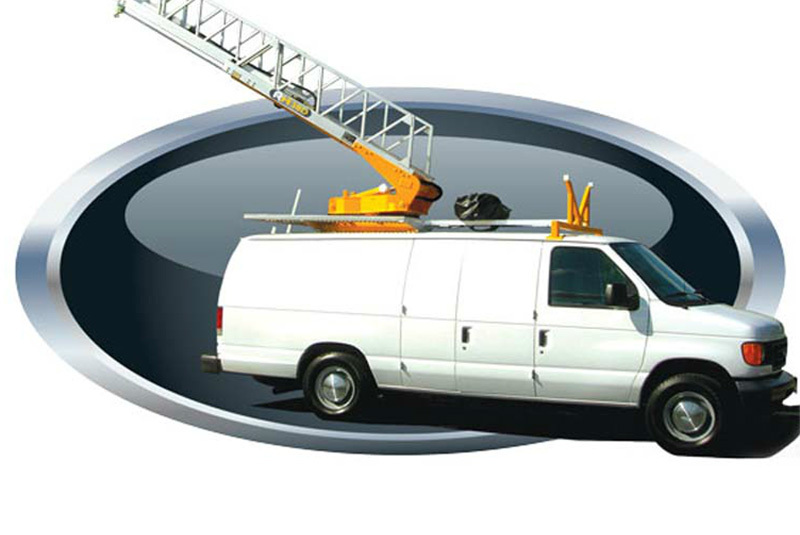 Safety - One of the major safety advantages is that in contrast to a boom truck, a telescopic ladder lets you access or come down from the bucket as needed. 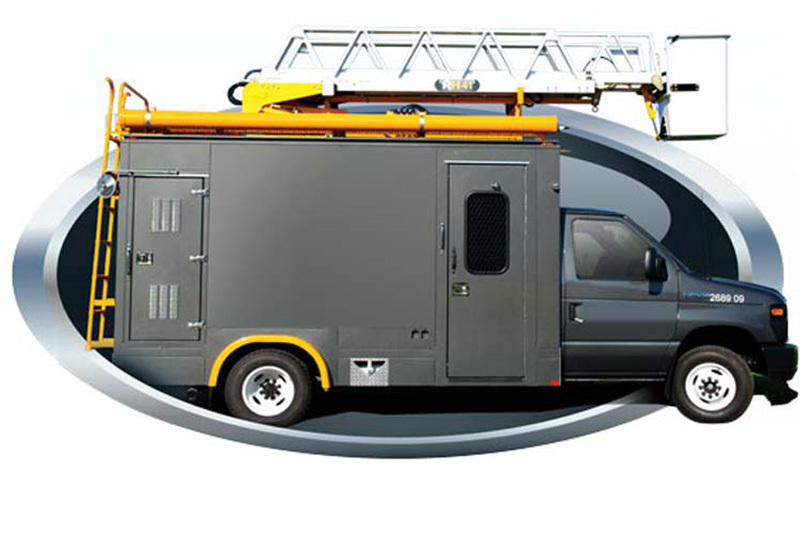 In addition, our insulated models protect the vehicle and ground personnel should the aerial ladder accidentally contact electrical wires. 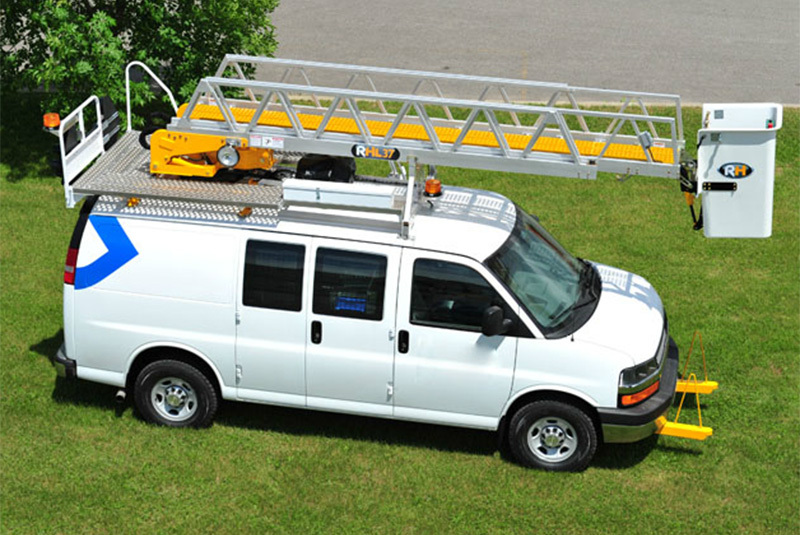 Quality RH aerial ladders are so reliable that we consider them to have a service life of 30 years. 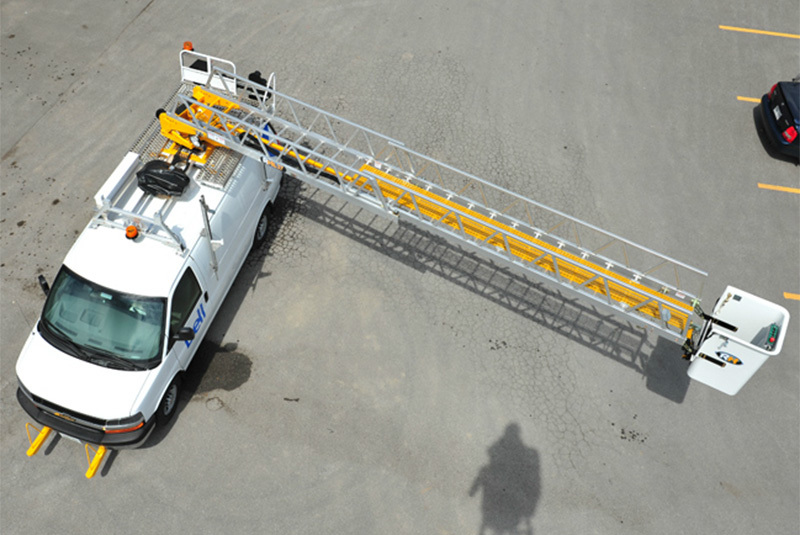 We offer a 5-year warranty on the structure of our aerial ladder equipment, and a 1-year warranty on parts and labour. 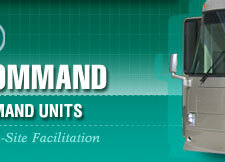 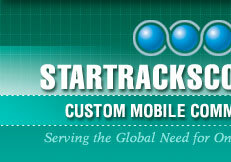 Storage Space - Our customized installations do not require a pedestal and thus take up less storage space. 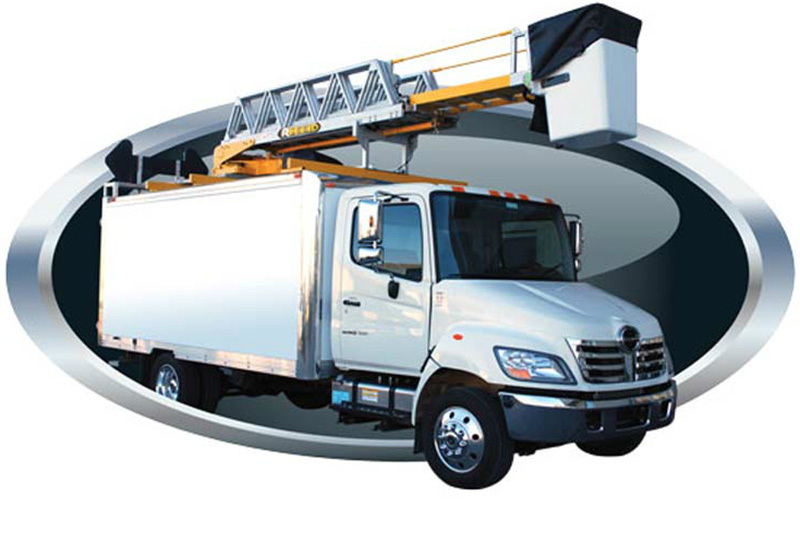 Weight is also reduced significantly, giving you greater load-carrying capability. 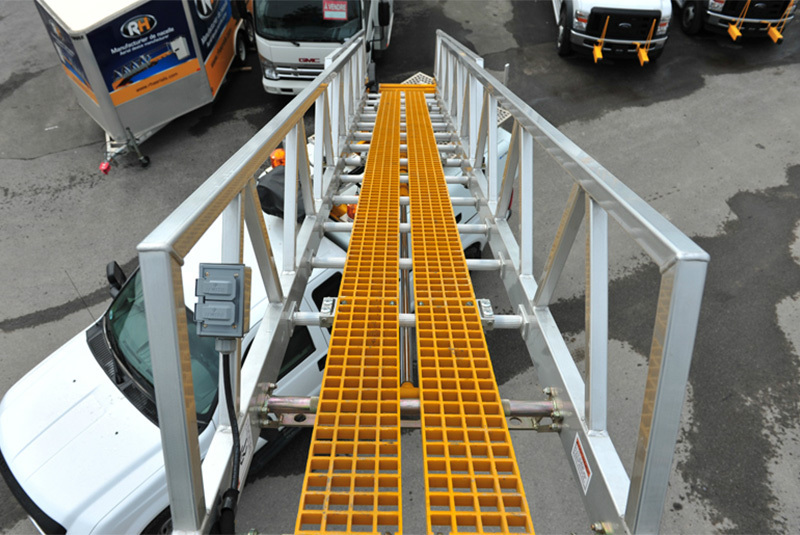 Increased Horizontal Reach - The design of our telescoping ladders gives them greater horizontal reach than conventional models and provides our aerial buckets with the best stability on the market. 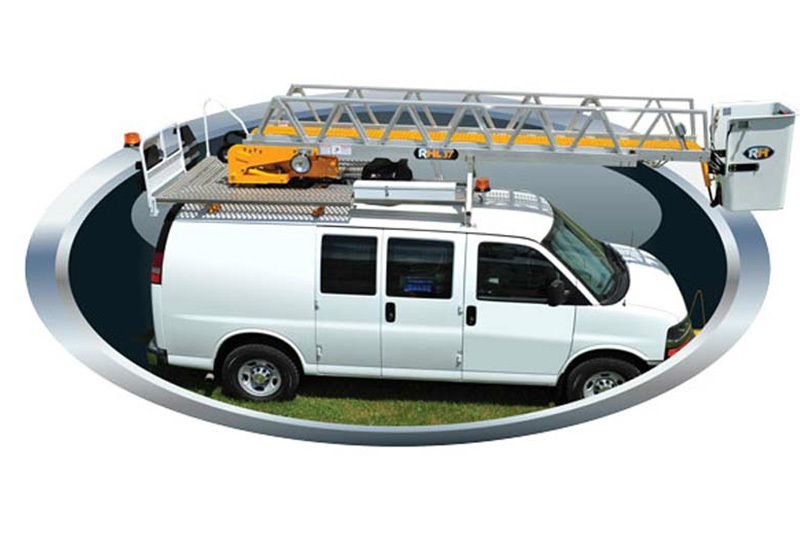 Robert Hydraulique equipment offers you better access to difficult-to-reach and off-road locations! 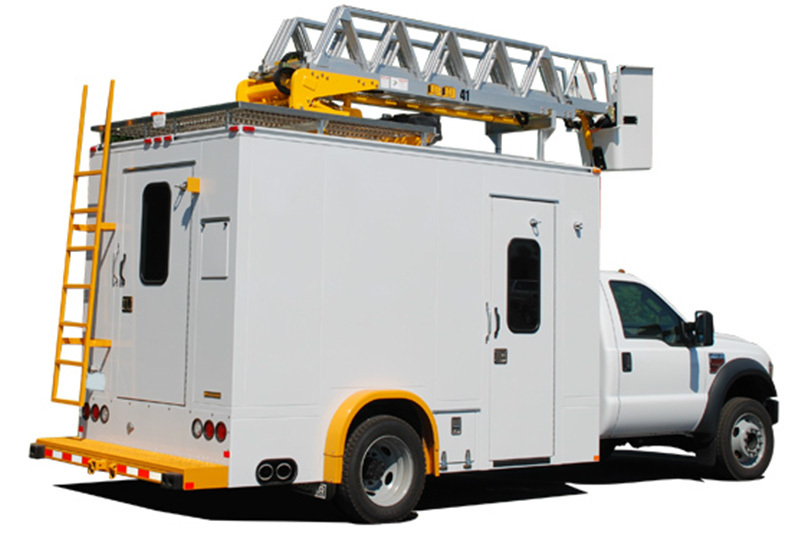 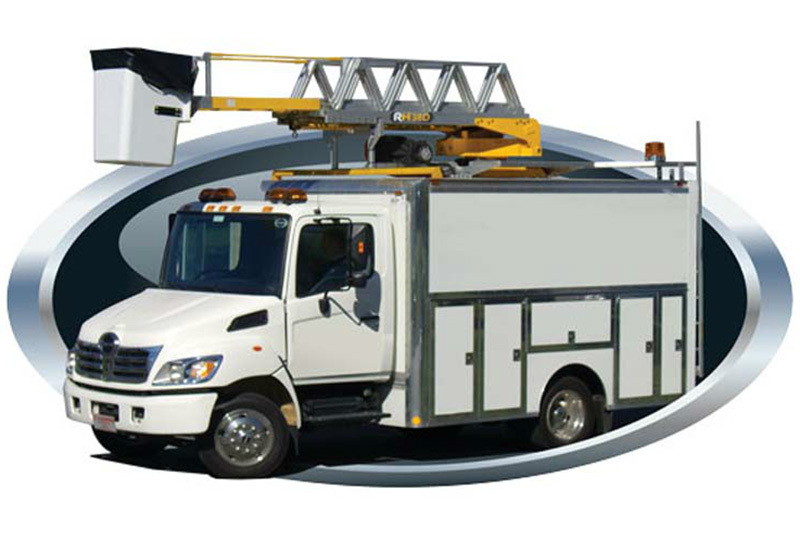 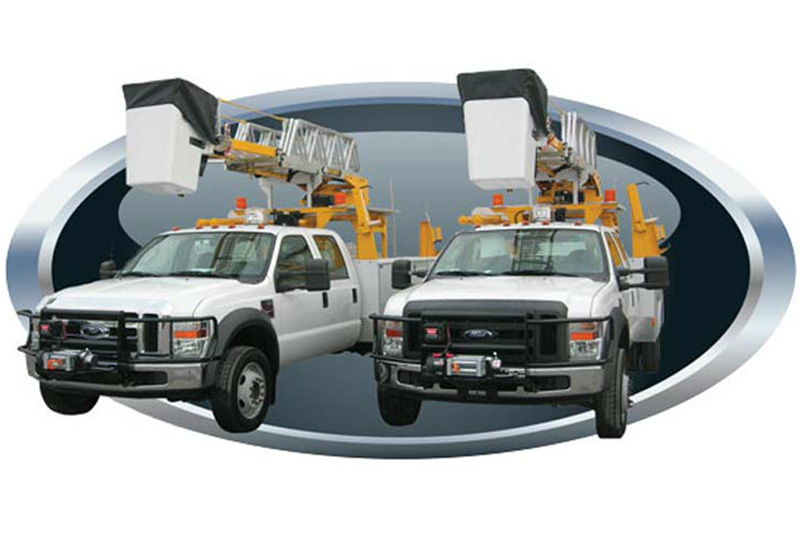 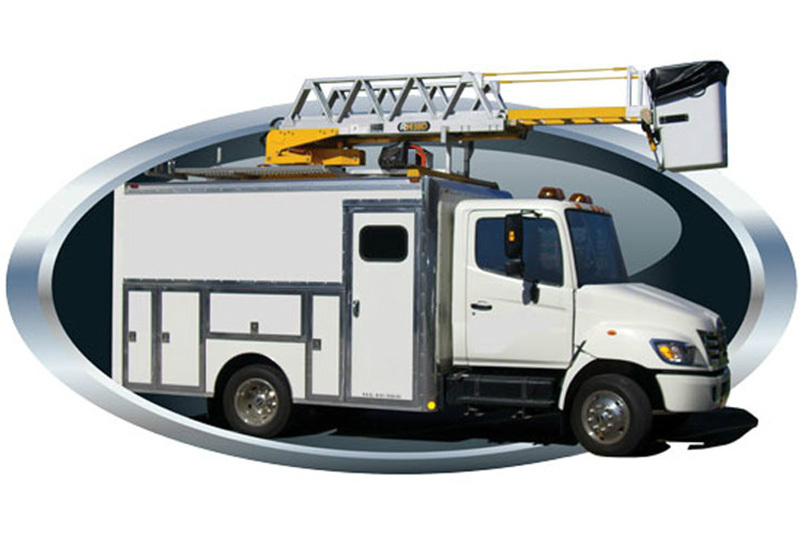 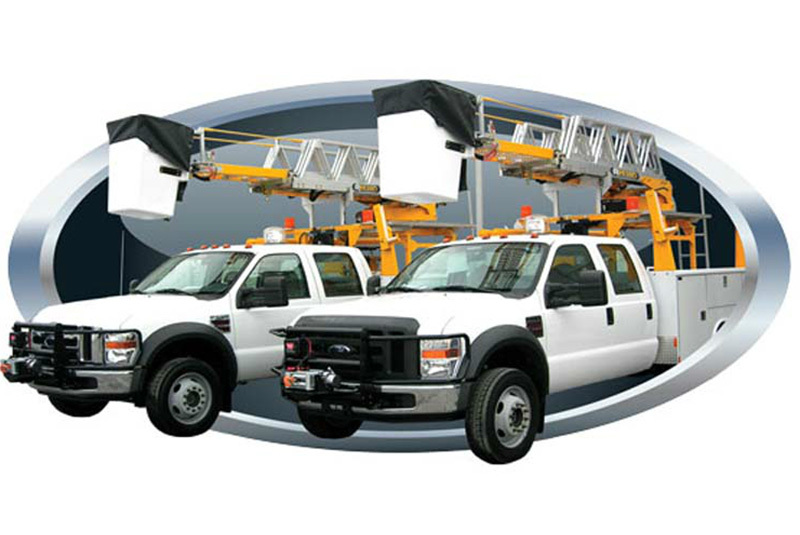 Electrical Autonomy - Our aerial ladders are equipped with power-generating units that provide sufficient autonomy for your projects. 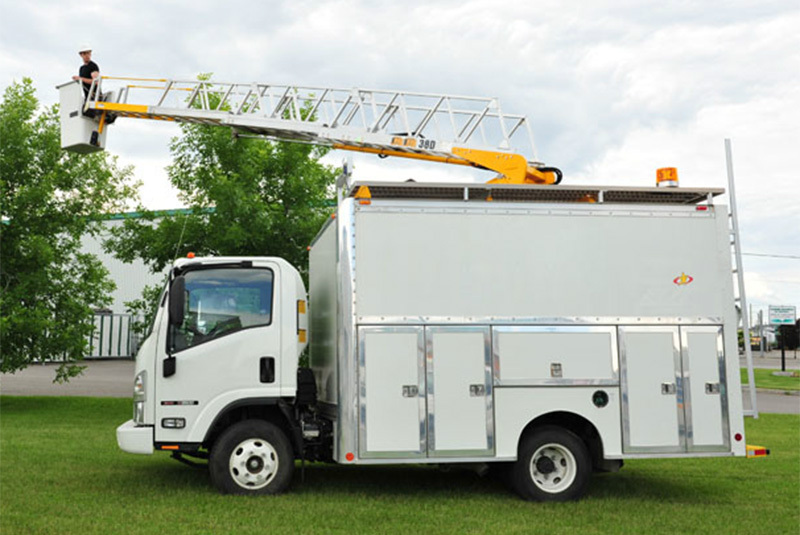 As a result, the truck engine does not have to be running to operate the ladder, which reduces fuel costs and exhaust emissions into the environment. 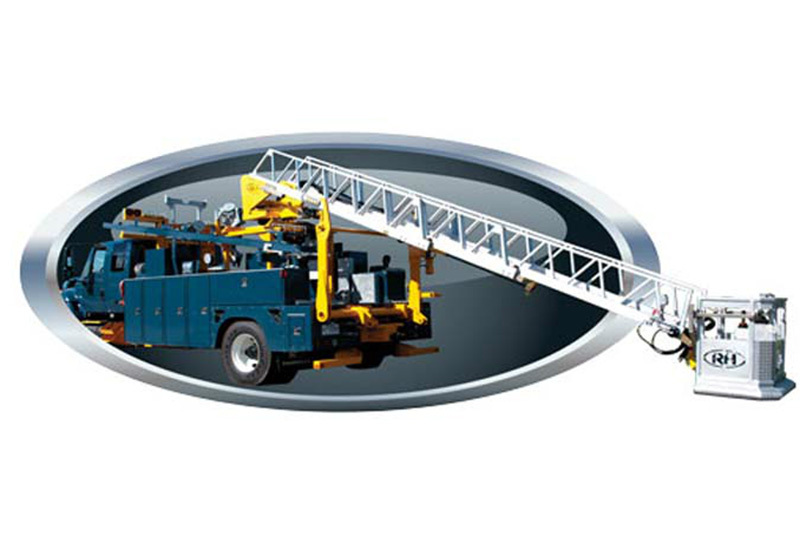 Automatic Bucket Levelling - An automatic levelling system is engaged whenever you raise or lower your RH ladders. 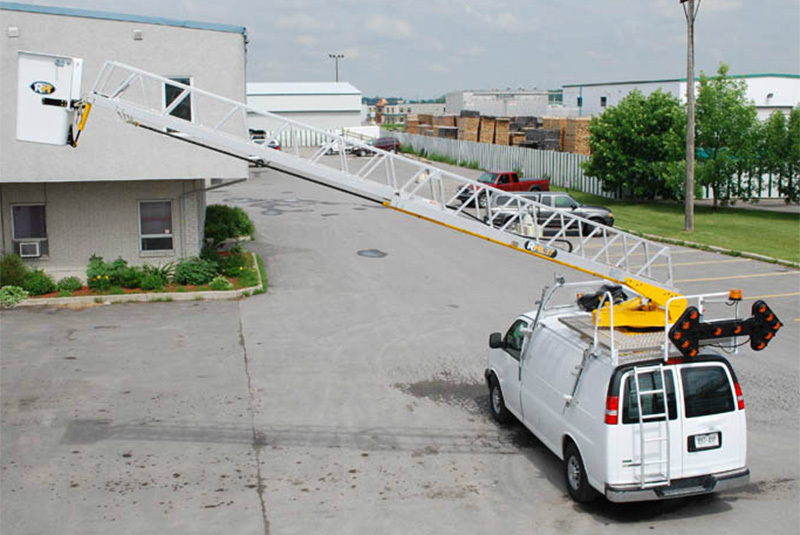 Numerous Options - Continuous rotation, ground access, folding walkway, a tool box in the bucket, hydraulic and/or electrical outlets in the bucket, work lamps, and a centralizer on the saddle are just some of the many options available on Robert Hydraulique aerial ladders and related equipment. 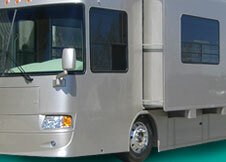 Click on the photos to see enlarged views.